Consultant on subjects mystical and magickal. "Gods say a lot of things. Not all of them are true." Soraya is an attractive woman with wavy brown hair. She typically dresses fairly simply, but appropriately for the local weather. In Boston, she often wears jeans and cable knit sweaters, while she tends toward jeans and t-shirts in Los Angeles, or possibly shorts and a halter top if the weather is particularly warm. 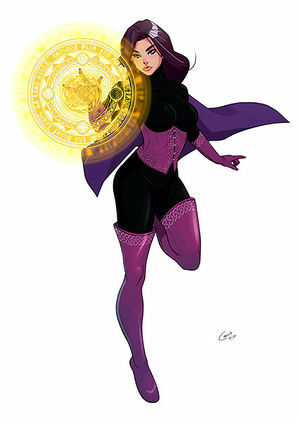 While acting as Black Orchid, she wears a black Versatex ® bodysuit complemented with purple boots, gloves, corset, and a thigh-length cape. She conceals her face with a stylized domino mask, which is sufficient to protect her anonymity. Soraya is curious and relentlessly upbeat. She has seen the horrors lurking beyond our world, but she persists in the belief that honor, hope, and courage will prevail against them. This can make Soraya seem flighty, or vacuous, but that's a false impression. She takes her role as Black Orchid very seriously, and she works very hard to be worthy of the trust which has been placed in her. Her lighthearted manner is evidence of her inexperience: she is still somewhat in awe of the powers at her command, the limits of which she has yet to truly test. She has supreme confidence that she will be able to deal with anything that comes her way, and she never fails to find hope and optimism in even the most dire circumstances. This relentless optimism is part of why Christine Somerset selected Soraya. Curiosity: The character lives and breathes to solve the world's mysteries. Enemy: The legacy of the Black Orchid has made many enemies over the centuries. Soraya Morgan had always been a little different. While other young girls dreamed of princes and ponies, Soraya dreamed of Peter Pan and Pippi Longstocking. When other young women were reading Cosmopolitian and Judy Blume, Soraya was reading Drawing Down The Moon and Mary Stuart. Soraya worked her way through college by working part-time at Umbra Solis, an occult bookstore in historic downtown Boston. When she began her postgraduate studies, she was promoted to manager of the book store, and has worked there ever since. It was while working at the book store that Soraya met Christine Somerset, one of the more popular authors of occult non-fiction, and, in Soraya's opinion, one of the few who weren't completely full of hot air. Ms. Somerset and Soraya took a liking to each other, and over the next few years Ms. Somerset took Soraya under her wing, teaching her aspects of the Arts which she would never feel safe putting into a popular book. It was under Christine Somerset's tutelage that Soraya was able to work her first real magick, drawing power from one of the many universes which border our own. Soraya's world would never be the same. And yet, the greatest revelation was yet to come. Thirteen months after Soraya's first "working", Christine revealed that she was more than an author of pop-culture occult books, more than a solitary practitioner of charms and illusions. She was a sorceress who had spent much of her adult life in the endless battle against the dark forces lurking at the edge of the mortal world. She was not only Christine Somerset: she was Black Orchid, the most recent in a line of guardians against the endless gnawing darkness which will eventually claim all. But while Christine's power was at its height, her body was no longer that of a young woman. Her strength and stamina were not what they once were. She needed to find an heir. Soraya became that heir. Christine passed on much of her knowledge and tools to Soraya, and the role of Black Orchid passed on to a new generation. A minor side effect of her powers is that Soraya's material needs -- food, clothing, shelter -- are no longer a significant concern. Through judicious use of magic, Soraya can obtain nearly any material good she requires. Her desires are modest, however: the only signifciant expenditure she has made since being granted the role of Black Orchid has been to purchase Umbra Solis from the previous owner, who wished to retire to Miami but could not afford to do so. Umbra Solis now serves as Black Orchid's sanctum. Few would suspect that upstairs from the bookstore selling New Age twaddle is one of the most complete occult libraries in the world. Black Orchid is an associate member of WestGuard, the well known Los Angeles posthuman team. In this capacity, she is generally consulted when the team encounters what appears to be an arcane or supernatural menace. However, Soraya is not always available, having both a "real job" at the book store and other less mundane obligations. Black Orchid is also a member of the New York Institute For Parapsychological Research, a privately funded consulting firm located on the island of Manhattan in New York, New York. Black Orchid is capable of doing nearly anything she can imagine, but her inexperience prevents her from making full use of her abilities. In combat, she tends to focus on the occult formulas and arcane artifacts which are most familiar to her, such as John Dee's "aether crossbow", which Soraya can summon or dismiss at will. With time and preparation, both the variety and the sheer power of her abilities is greatly improved. The more time she has to consider her options, the more dangerous she becomes. This page was last modified on 20 February 2016, at 19:22.